Classic Cheese Steak “old school” style that’ll make your kids smile. Slice thawed Organic Valley Steak into paper-thin strips, almost shaving the beef. Peel and halve onion. Slice into paper-thin “half moon” pieces. Halve the peppers, remove and compost the seeds, and then slice into thick wedges. Warm 1 tablespoon of olive oil in a large skillet over low-medium heat. Add onions and cook 8–10 minutes, until caramelized and softened, stirring frequently. Transfer onions to bowl; add colorful bell peppers to same skillet, still over low heat. Cook peppers 10–15 minutes, until soft and tender, flipping often. Transfer to bowl with onions. Season onion-pepper mixture to taste. Cover bowl to keep warm. In a clean skillet, warm the remaining tablespoon of olive oil over medium heat. Cook the beef until lightly browned and cooked through, stirring often. 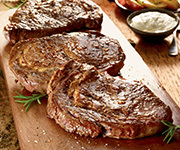 You may have to add more olive oil as Organic Valley steaks are very lean. Pile beef strips, peppers and onions and Organic Valley Provolone cheese slices inside a soft hero roll. Enjoy with a big salad, crunchy munchies, and farm fresh Organic Valley Milk! Kids in the Kitchen: The little folk (3-5) can remove the “guts” from the bell peppers with their fingers. An adult or much older child (skilled teenager) can complete the preparation for the Cheese Steak Sammy, as onions and cooktops aren’t a good fit for the youngsters!